Ireland will begin collecting €13 billion from Apple around March, with payments expected to continue through September, according to Irish broadcaster RTÉ via Cult of Mac. "However, identification of the escrow agent/custodian by the end of March 2018 will then allow for a payment into the escrow fund account, with payments continuing through the course of April, May and June and up to the end of September 2018". 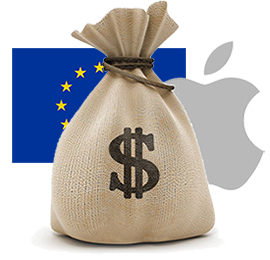 The money will be held in an escrow account while both Apple and Ireland continue to battle the European Commission, which in August 2016 ruled the iPhone maker received illegal state aid from the country, and ordered the Irish government to collect up to 13 billion euros—nearly $16 billion currently—in back taxes. Ireland is required to collect the money until the legal process is completed, according to the report. Apple has previously said the money will be reported as restricted cash on its balance sheet once it begins making payments. The premise is that the Irish government gave Apple unfair advantage between 1991 and 2007 by allowing the company to move income from the European market through two "non-resident" head office subsidiaries based in Ireland, but Apple says the European Commission made "fundamental errors" in its findings. Apple CEO Tim Cook has called the decision "total political crap" and said Apple pays all of the taxes it owes based on the laws of each country in which it operates. Likewise, the Irish government said it did not give favourable tax treatment to Apple and added that it "does not do deals with taxpayers." Apple expects its appeal with the European Union's highest courts to take several years, but it is confident the European Commission's decision will be overturned, in which case the €13 billion would be returned to the company. Apple's plans to repatriate much of its foreign cash reserves under new U.S. tax laws, which lower the corporate tax rate to 15.5 percent, will have no affect on the outcome of this European tax case. Stop crying and pay your ****ing taxes like I PROPERLY do every year. It's fine to take a position either pro or con on this but anyone who reacts the way you do does not have even the fuzziest understanding of the issue. Ireland is actually backing Apple on this and saying "keep your money" It's the EU demanding that Apple pay Ireland. Perhaps EU lawmakers should close loopholes. Rather than whine when accountants and tax lawyers figure out how to use them. Instead of retroactively changing rules. Stop whining and get a better ****ing accountant. Apple DOES properly pay taxes. As little as possible, like anyone rational would, but within the constraints of the law. Do you pay as much taxes as you possibly can, or as little. Oh, OK, that's what I thought. Did you read the article? Do you pay taxes you're not required to pay? I take every deduction (tax avoidance scheme) I can when I file my taxes. I don’t cry, but curse quite a bit. Ireland have never been wealthier in their history, and it's all due to these tax breaks. They were beating the crap out of other countries when it came to business-friendliness. But other broke EU countries have what always exist in the progressive mindset - envy. Ireland should do a Irexit from the EU. Why should a country subjugate itself into the whims of unelected officials in Brussels? So many people still don’t understand this issue. Ireland can set their corporation tax rate whatever they like - as long as every business gets the same rate. The problem here was that they gave Apple a special rate while everyone else had to pay the standard rate. That’s illegal under EU law because it’s blatant discrimination. If I had a business in Ireland I would not be happy that I had to pay 12% business tax while Apple only had to pay 1% business tax. What if the US government let Apple pay a lower business tax rate than every other business. Would that be fair? While I think it's wrong what Apple did here (avoiding taxes), Ireland is to blame as well as they wanted an incentive for Apple to move to Ireland.